I am all about this cool weather. 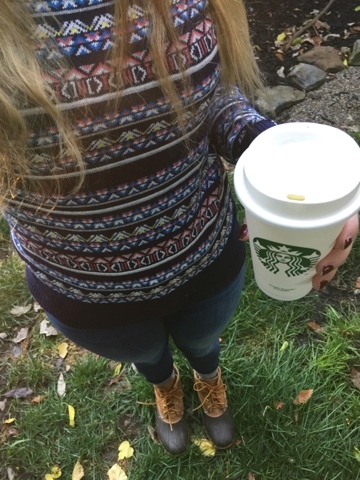 Sweaters, blanket scarfs and boots every day! Today I was pretty pumped bout my outfit. It was a brisk 35 degrees this morning and I was thinking cozy, cozy, cozy as my inspiration. Don't mind my crazy long hair that needs a trim! My #ootd was a quick, comfy, warm outfit perfect for a long day at Law School. I have been searching desperately for one of these and this one is perfect. It is soft, warm and a nice fit. Also, the price point it great and the quality is awesome. When I bought mine there was a buy one get one 50% off deal so I got another cute sweater as well at a price you can't beat. The greatest fall boots ever. I wear them with cozy socks to keep my toes warm and I know my feet will stay warm and dry all day. They also give a little more casual look for fall which is sometimes what I am seeking for a cold day that I just want to be cozy. These are my favorite jeans in the whole wide world. So comfy, so sleek and overall just the bomb. I mean, Duchess Kate swears by them, need I say more????? That was short and sweet . I'm glad your long day walk after law school turned into a blogpost .